We offer private and group ballroom and country dance lessons in Granbury, Texas from beginner/social up to advanced/competitive levels. Social dance enables you to navigate the dance floor in any situation such as night clubs, weddings or private parties. Private lessons are the most comprehensive and taught by appointment. Group lesson times are posted on our monthly calender. We offer three levels of instruction, Bronze Silver and Gold. You can learn "just the basics" or increase your knowledge through all the levels of dance! Please call or e-mail us. 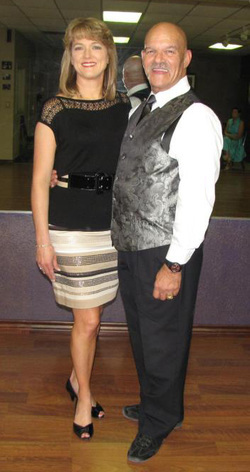 We'd love to answer your questions and help you get started with ballroom and/or country dance lessons in Granbury, Texas! Contact Shall We Dance Texas.....It's where FUN happens!